Day 252: Happy 10th Birthday! Today is the birthday of my niece Ella. When she was a toddler her Mom would bring her to work and Ella would sit by my workbench as I baked bread. She was tickled if I gave her a piece of dough to play with and seemed to enjoy watching the goings on in the kitchen. One thing I remember from those early days is that Ella didn’t talk much. I guess that’s true for second born children – their older siblings speak for them and they don’t have to work hard to communicate. My son, who is the second born in our family, didn’t talk much when he was 2 or 3 because his sister did that for him. Sometimes the conversation went like this, (Alexandra speaking) “Coco wants a cookie” and all the while Coco was sitting silently, watching with wide eyes as the situation unfolded. Though I don’t see Ella very often, I try to find ways to let her know that I am thinking of her. In the past I have given her baking paraphernalia and she seemed to like that and so tonight I extended an offer of a pie baking lesson. It would be fun to share my love of baking and perhaps a baking tip or two. 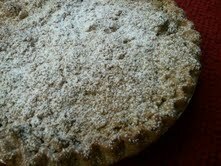 But for tonight, I brought a warm Apple Crumb Pie to Ella to celebrate the end of her first decade on this lovely planet. May all of her days be happy and bright.